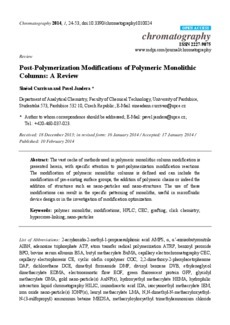 The vast cache of methods used in polymeric monolithic column modification is presented herein, with specific attention to post-polymerization modification reactions. The modification of polymeric monolithic columns is defined and can include the modification of pre-existing surface groups, the addition of polymeric chains or indeed the addition of structures such as nano-particles and nano-structures. The use of these modifications can result in the specific patterning of monoliths, useful in microfluidic device design or in the investigation of modification optimization.